Feodor Mikhailichenko was born in Rostov in 1927. When the Germans occupied Rostov in 1942 his naval school was evacuated from the war zone to the rear, into the unoccupied part of the Soviet Union. Feodor was sick and stayed behind with his parents. A neighbor denounced him and he was sent to forced labor in Germany. He was 16 years old when he was arrested by the Gestapo in Dortmund, Germany, in November 1943, charged with robbery and sent to Buchenwald concentration camp where he became prisoner #35692. Inmates in the camp had established a well-organized communist inspired resistance network which was led by German political prisoners, many of whom had been in the camp for many years. They succeeded in having the Camp Commander set up a special childrens' barrack – "Block 8" - that accommodated youngsters who had been sent to Germany for forced labor. Mikhailichenko was put in this barrack. In winter 1944-45 the camps in the East were being evacuated in the face of the advancing Red Army, and tens of thousands of inmates were marched westward under terrible conditions in the so-called "death marches". A significant number of these marchers arrived in Buchenwald, including some Jewish children who had somehow survived the horrors in the east. Among these children was eight-year-old Israel Meir Lau who was to become one of the camp's youngest survivors. Israel Meir Lau was born in 1937 in Piotrków Trybunalski, Poland. Most of the community was destroyed in 1942 when the city’s Jews were deported to Treblinka. Among the victims was Israel’s father, the rabbi of Piotrków, Rabbi Moshe Chaim Lau and his 13-year-old brother, Shmuel. Israel, at the time a five-year-old known as Lolek, his brother Naftali and their mother survived this liquidation, but it was only a temporary respite. In November 1944 during selection the mother was taken. She must have known what awaited her and made what was probably a most difficult decision. She decided to part from her young son and entrusted him to his older brother, Naftali, who was taken to labor camp. The two brothers were never to see their mother again – Chaya Lau was murdered in Ravensbrueck. Naftali, now in charge of young Lolek, was taken to the slave labor camp Czestochowa and from there to Buchenwald. Naftali fulfilled his mother's last wish. He protected his younger brother and shielded him from all dangers. 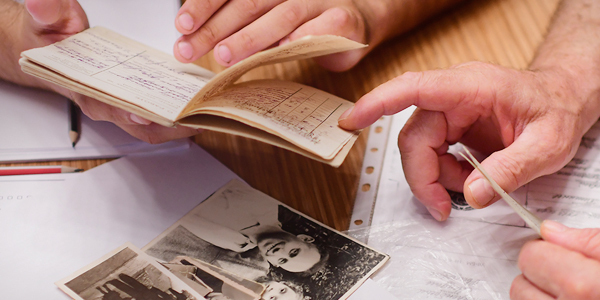 Carefully hidden in a bag on his brother’s back Lolek arrived in Buchenwald concentration camp in January 1945. Upon their arrival in Buchenwald the two brothers were separated, and Lolek was put in Block 8 with other youngsters and children. It was his great fortune that even now, having lost his brother’s protective aid, someone was found who took care of him. In his memoirs, "Do Not Raise Your Hand Against the Boy" Israel Meir Lau described his Russian rescuer, Feodor and the help he gave him. Despite the danger, Feodor would steal potatoes, light a fire and cook them for the little boy. He took other measures to make sure that the child would be able to survive. He knitted ear warmers to protect him from the freezing cold. "Feodor, the Russian, looked after me in the daily life like a father would for a son. His concern and feeling of responsibility gave me a sense of security …" On 11 April 1945, the day the U.S. army reached the camp -a day Rabbi Lau described as his rebirth - Feodor held him close to him and sheltered him with his body. After liberation the two parted, and Israel was never to see Feodor again.. Soon after the end of the war, in the summer of 1945, Israel and Naftali came to the Land of Israel. He studied in various yeshivot and became a rabbi. Between the years 1999-2003 Rabbi Lau served as the Ashkenazi Chief Rabbi of Israel, returning afterwards to his position of Chief Rabbi of Tel Aviv-Yaffo. In November 2008 he was appointed chairman of the Yad Vashem Council. Rabbi Lau never forgot his rescuer. He only knew his first name and that he was originally from Rostov, but when Lau first visited the Soviet Union, he asked the Secretary-General of the Communist party to help him locate the man. His interlocutor promised to put an ad in Izvestia, a leading Soviet newspaper. But no one came forward. Only 63 years after the events, in the course of doing research on Buchenwald, Kenneth Waltzer, an American researcher from Michigan State University, managed to identify Rabbi Lau's rescuer as Feodor Mikhailchenko. By that time Feodor had already passed away, but his daughters were found. In August 2008 the Department of the Righteous contacted Yulia Selutina, Mikhailchenko’s daughter. She said that her father did tell his family about the children in his barrack in Buchenwald, and about one small Polish child in particular. After the war he even tried to find him, but in vain. Feodor Mikhailchenko died in 1993 at the age of 66. On 25 January 2009 Feodor Mikhailchenko was recognized as Righteous Among the Nations.